Theresa Joy : Day 1 ~ 365 Days of Pinterest! "Fairies in a Jar"
Day 1 ~ 365 Days of Pinterest! "Fairies in a Jar"
So I'm addicted to Pinterest .. can you blame me .. enticing recipes, exercise tips sure to firm those glutes .. fashion finds, hair tips, home improvement .. and DIY fabulous-ness ! But there's no use in pinning if you are not putting the pins to use .. so here I go ... I started with fun little DIY pin .. "Faries in A Jar" ... one of my fav pins .. but a fellow pinner had commented that it didn't work so I gave it a go .. with a minor tweak I thought might have been why it did not work for her ..
first I took fine glitter from the Dollar store .. about 2 Tbs. 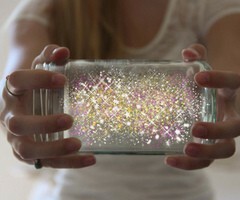 drop the glitter into your jar and roll the jar in your hands so the glitter coats the inside of the jar evenly. 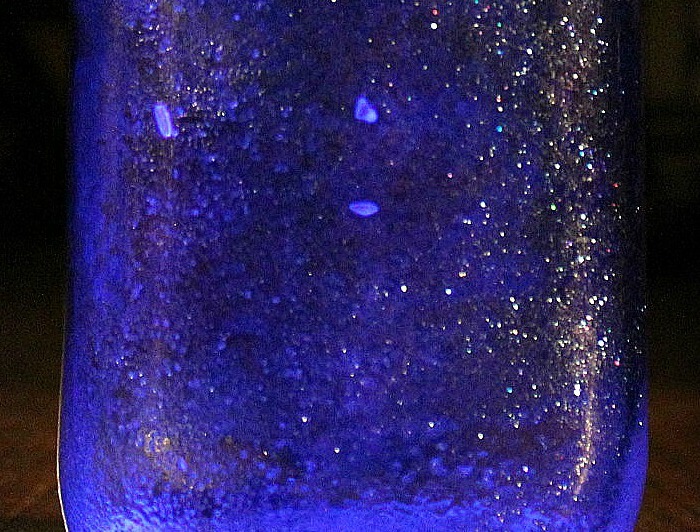 (I used blue and pink) The photo looks like I used alot of glitter but it was just a fine coat .. almost translucent. Crack your glow stick to illuminate it . 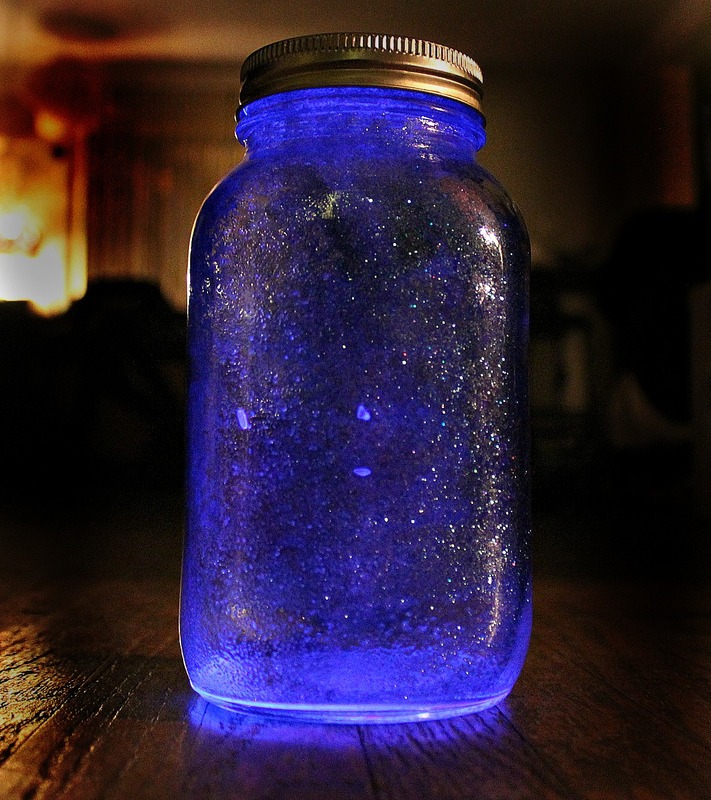 Cut open your glow stick and pour the liquid inside the jar. Seal your jar and roll again until the liquid completely covers the outside of the jar. At fist I thought Id need 2 or 3 glow sticks but the liquid eventually did cover the entire inside of the jar. Thats the deal! 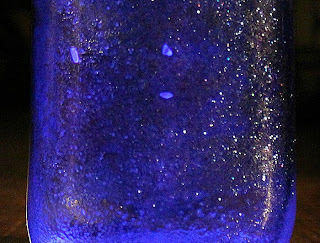 Of course in the pitch black I didn't see much 'shimmer' but in dim light the jar did look pretty magical .. It had that cool blue glow and the low light in the room caught the flecks of glitter so it was a glittery glowing fairy like jar o' fun ... pretty close to magic. I do have to say .. that glow stick liquid smells mighty toxic so try to keep it in the jar. Also it only glows for about 30 min. Still a fun little project. are you sure the original pic doesn't have water in? 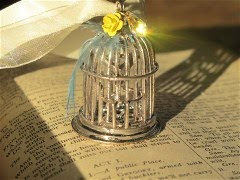 Thank you ... your faire jar looks pretty in blue. I don't understand the 30 minute glow. I used glow sticks last year at halloween (opened and poured into a tightly sealed pickle jar) and they glowed for several DAYS. I didn't add anything to the mixture. I only drew a silly face on the outside of the jar with a permanent marker. They were bright enough that they emitted good light for the first 3 nights, but after that they started getting dimmer and dimmer. Still............Could it be that adding anything to the 'glow juice' is breaking it down so that it loses it's glow properties? I'm really curious about that. Any thoughts? 365 Days of Pinterest Day 4 ~ DIY Glitter Pumps! Day 2 ~ 365 Days of Pinterest! "Orange Candle"